Our new iPhone 4 came a day early and we're pretty much thrilled! Fortunately for us, we live in the East Coast and we had a good couple hours jump ahead of the rest of the US when we did our pre-order. At around 730am EST, the Apple store was already having problems the storefront so we went and ordered our phones through AT&T which went very smoothly. I was finished doing both our orders in less than 10 minutes! The iphones were supposed to be delivered on the same day as "launch day" on June 24 but we started seeing some arriving as early as the 22nd! A good 2 days ahead of schedule. This is a great move on Apple and AT&T's part so that the activation process will be spread out for a couple of days since I'm pretty sure there will be a LOT of surprises on Launch Day. 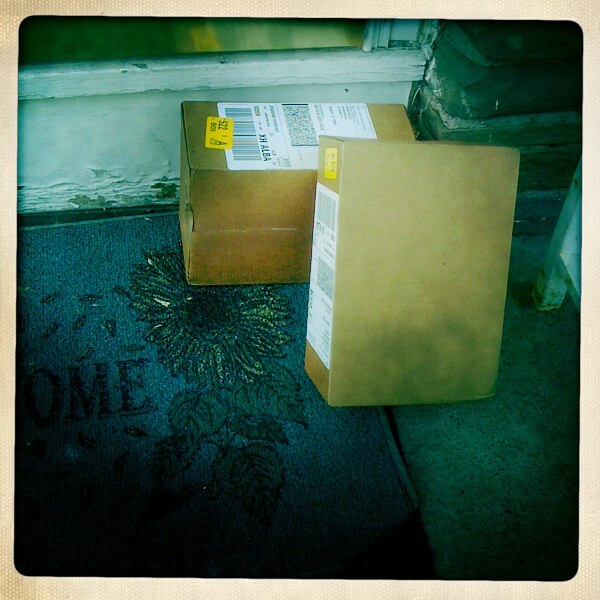 The packages came in 2 unassuming boxes left in our front door (Good thing it didn't rain). This is probably the last picture that I took with the iPhone 3G and I can't wait to try out the new 5 Megapixel Camera and HD video. The new box is deep and shows the new design elements that Apple made for this generation. I'm always impressed at how Apple always make sure that the packaging is well designed. Here we see the phone on top which kind of reminds me of those marble coffins with the white rectangular box and a likeness of the person on the top... A little morbid I know but still impressed. The top face of the phone hits the inside of the top box. There's a thin padding underneath but try to be careful when you get it. I love the new design of the iPhone, it's sleek and industrial and it feels very solidly built. This felt the same as when Apple just started making the unibody macbook pros. As soon as you hold it you can feel that this is really a well made machine. Inside the box is the usual accessories that Apple include with their phones. You have the USB sync cable, earphones and power adapter Although one thing that is absent is the wire-paperclip 'thingy' that you use to take out the sim. Although for the couple of years that we had our 3G, we never really found a need to use it. Once you're done ogling your new phone, it's time to activate it. According to the email that AT&T sent, you can activate your new phone by calling their activation line or by going to http://www.wireless.att.com/businesscenter/activations/. When you activate online, the first thing it asks is for your order number and activation number. This should have been sent to you via email when you placed your order. Then it will ask you for your IMEI Number as well as the ICCID number which is conveniently printed in the smallest caps possible at the bottom of the box. Once you've entered everything correctly, you'll see this Status screen and hopefully the Activation Status will say 'Complete'. When I did the activation today, it only took less than 5 minutes for the whole process. I wonder how long it would take tomorrow when all hell breaks lose! Once you have your phone synced with itunes, you can now enjoy one of the best phones available. So, what do I think is one of the best features of the new iPhone? Well, the design for me is a given but I think the best feature IMHO is the Retina display. When I saw that Steve Jobs' Keynote I always wondered why he was so emphatic whenever he mentioned the Retina display. Boasting the highest resolution in a phone, He claimed that you can't even see the jaggies or the pixels and that the color and contrast was spectacular. Boy was he right. YOU have to see one in person to believe it. The text is crisp like you would see in a printed book and the colors and sharpness of each picture and icon is amazing. There's a lot more to be said about the new iPhone and I've barely even said anything about the new IOS4. But one thing's for sure, Apple really nailed it with this phone and we're just happy and lucky to be able to enjoy it. Check out Engadget's review of the iPhone 4. They have some really nice comparisons on the new Retina Diplay. Good luck to everybody that's lining up tomorrow. !